One of the things that we would like to know is what sort of snow density and packing can we expect at the site. Although there are lots of measurements and studies on this sort of thing, local conditions can strongly affect what actually happens. Additionally, we wanted to survey some of the different locations and see what sort of snow/ice conditions would be found. 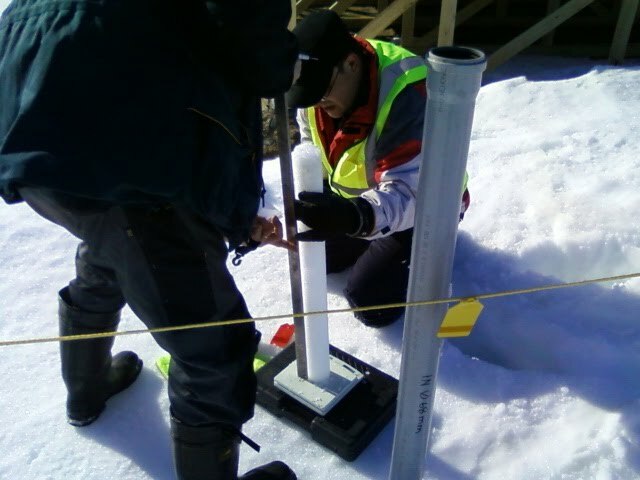 Therefore, as part of the assessment of the winter test-tile experiment, we have also taken a number of snow/ice depth measurements. We've also looked at a number of cores to see how the snow has been packed. Particularly in the drift areas. 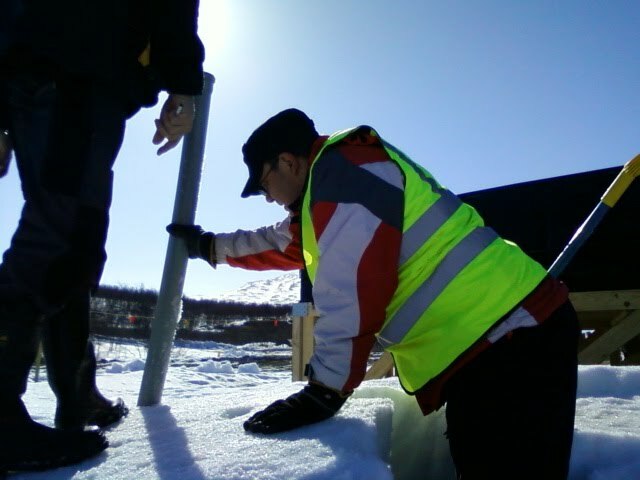 Pertti Ylitalo and Toivo Iinatti place a core-extraction pipe in the heavy drift on the 'north face' of the raised test tile. This is the side of most of the prevailing winds and also the side that remains in shadow for the longest. 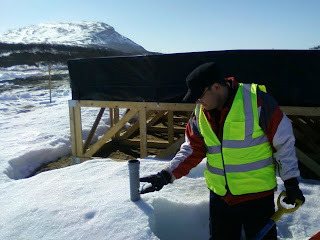 Once the extraction pipe is in place, it has to be carefully dug out so as not to disturb the sample. Then, once it has been successfully extracted, the core is subjected to a set of basic measurements to characterise the situation at that location. Long cores like this one are fragile and difficult to work with.